To varnish or not to varnish. Some painters don’t like the glare and shine of gloss varnish, preferring a matt or satin finish, or not varnishing at all. 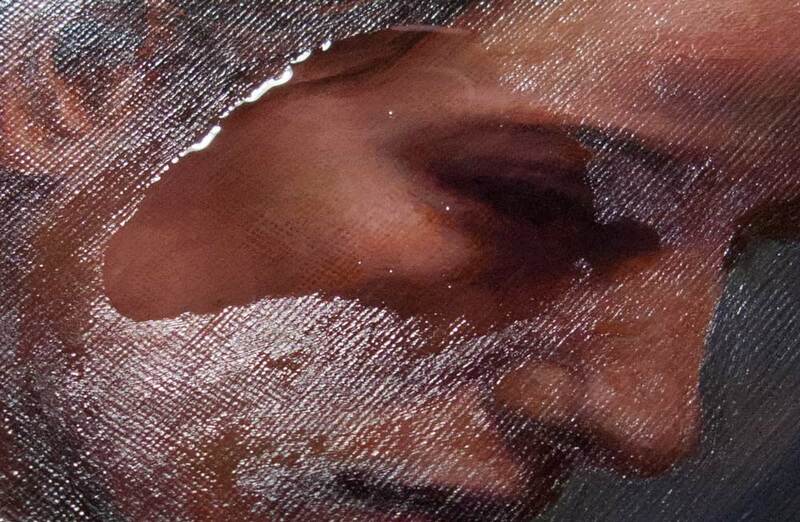 There are matt varnishes which contain a small amount of wax to take away some of the glare, but for paintings with dark areas this can seem like the worst of all worlds: there is still a sheen of glare (though not as much as with gloss) but the deep tones become cloudy due to the wax. Maybe it works well with high-key paintings. Varnish is there to protect the surface (it’s a removable, replaceable clear layer) but it also brings out the depth and vibrancy of the original wet paint. It also evens out any patchy, sunken-in areas, which is where I find it most useful. Some pigments sink in more than others (ivory black and burnt umber seem to soak up all the oil) and mediums added to the mix can alter the final gloss. Thick impasto can have a glossy sheen next to paint thinly applied with a brush. It’s a minefield of confusion which I attempted to clear with systematic testing, but like many of these experiments I ended up throwing various combinations of paint and varnish on the canvas in the vague hope that something useful would come out of it. Here’s a painting of a rose (this was originally going to be a post about painting a rose from life, with the various challenges that presented) with a background that contains large areas of ivory black. It looked deep and dark when wet, but as you can see from the photo, it sinks in really noticeably to a dull matt finish. So much of the oil is soaked up that the paint doesn’t even feel particularly well bound to the canvas, as you can see from the top-right edge where the paint was lifted during oiling out. I was going to go in to detail about all the various combinations of paint and the effects of thickness of application, oiling out, layering, and so on. But you’re spared all that and here’s a picture instead. The conclusion I reached: just apply a layer of gloss varnish at the end and all the problems are solved. Except for one: whilst sunken-in areas regain their depth, any areas that are already very glossy become even more glossy, so there’s still some unevenness. The portrait at the top of this post had glossy areas where I’d used stand oil in the paint mix. Adjacent areas were relatively matt. The gloss varnish evened things out a little but not completely. I tried applying a number of coats but they all seemed to dry with the same result. In the end, in a spirit of experimention and desparation, I poured a pool of varnish over the non-glossy areas, hoping for an evenly-glossy final painting. It didn’t work, but I quite like the photo. Things to try in future experiments: lightly abrading the very glossy areas to take down the sheen before applying the final varnish. 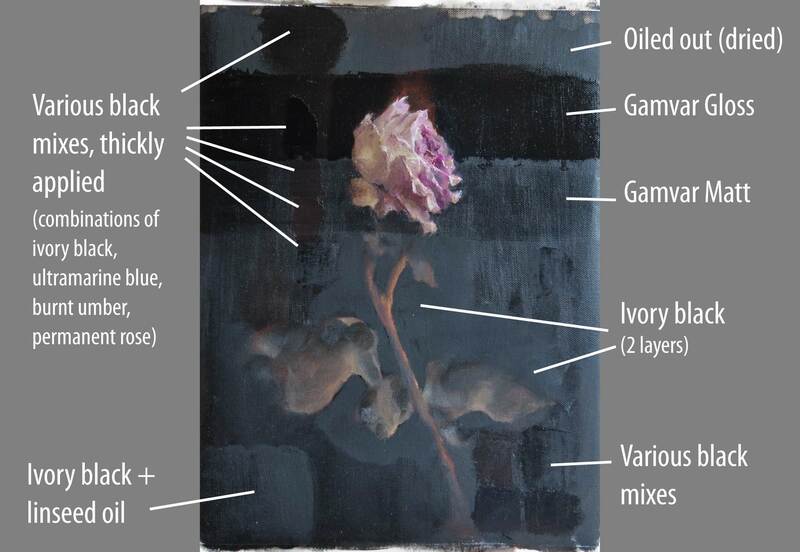 Here’s Mark Carder with a video on how to varnish a painting. However, if you’re using Gamvar (as I did) the application needs to be thinner. See here for Gamblin’s varnishing instructions. Get an email if there are new posts.